PDXpert provides a centralized repository of your part and document data, including management of approved supplier sources, bills of materials, revisions, and engineering changes. A "live view" of your part and supplier data is available from the Microsoft SQL Server database via an ODBC connection. This note outlines the method for using PDXpert PLM software's server-side views to support OrCAD Capture CIS's component libraries. Applies to PDXpert PLM server software release 7.0 and later. This demonstrates OrCAD's use of the Microsoft SQL Server database. Using the client-side SQLite database requires PDXpert release 9.1 or later; see the OrCAD CIS client-side application note. By assigning appropriate custom attributes to PDXpert part type templates, components managed within PDXpert can support external computer systems. In particular, attributes required by OrCAD Capture CIS — such as component values, schematic symbols, layout footprints and source part numbers — can be created and managed within the PLM system. There are several alternatives for attaching the OrCAD Component Information System (CIS) electronic CAD application to PDXpert's SQL Server database. Connect OrCAD CIS directly to the PDXpert public views. From within Microsoft Access (or similar tool), link the PDXpert public view(s) as an ODBC external data source. Create the queries required by OrCAD CIS and then attach OrCAD to these derived library views. Create PDXpert Views collection member(s), which overlay the PDXpert public database views, using SQL Server Management Studio (SSMS). The views appear as normal tables to OrCAD CIS. If you're comfortable using SSMS to access a SQL Server database, this approach is powerful, flexible and simple to maintain. SSMS is included with higher-end versions of SQL Server, and a free Express version can be downloaded from the Microsoft website. Before connecting OrCAD CIS to the PDXpert database, you'll first need to define custom attributes to support its component libraries. Where different part types have identically-named custom attributes, these will be merged into a single column. For example, if your Resistor and Capacitor part types both have a custom attribute named Value, the resistor value (say, 22K) and capacitor value (say, 10nF) are merged into the view's single Value column. 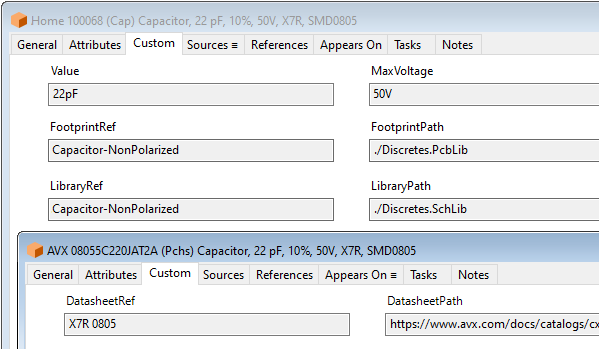 If you want a small set of attributes that are shared across all items (e.g., Category, Value, Tolerance, Rating, Symbol, Footprint, Datasheet), then these can be created within a single PDXpert Part Types collection member, say Purchase. The Category would be the selector for your OrCAD CIS libraries. This is a useful complement to non-significant part numbering. You can also create a series of PDXpert part types, each of which can have both common attribute names (like Value, Symbol, Footprint) as well as unique attributes (Rating, Tolerance, Dissipation, Gate Count, Forward Drop, etc.). If you're using category-based part number prefixes, then you may already have many of the types defined. Your supplier part types can be matched exactly to your own parts' types (supplier resistors use the same Resistor part type as your own resistors). However, the source's custom attributes would have limited value, since they'd mirror your own part's custom attributes. On the other hand, your supplier parts could be created from a common Source part type with its own set of custom attributes (like a link to the supplier's website or datasheet). Part properties in OrCAD CIS can be mapped to standard and custom attributes within PDXpert software. For more information about OrCAD property requirements, refer to the OrCAD CIS Users Guide, "Determining part properties" section. For information about PDXpert software's ODBC views, refer to the help guide Contents > How to report, import & export >Using ODBC for export > ItemMasterView column reference and > SourceItemMasterView column reference topics. You can also group items with similar characteristics into shared PDXpert part types ("Capacitor"), and a custom attribute can define subtypes ("Ceramic", "Polystyrene"). This value may be volatile, and is typically maintained in the purchasing and manufacturing system. The PLM system manages parts with technical characteristics that are defined and documented by the original manufacturer. The distributor has no effect on these characteristics, and engineering should be indifferent to which distributor is selected to supply the part. If you ignore OrCAD's distinction between distributor and manufacturer, you'd just consider these columns Source_1 and Source_2 regardless of their actual role in supplying your parts. You should always rank the manufacturer, with number and datasheet, as preferred over the distributor and its part number. The following example uses distinct part types for resistors and capacitors, and all supplier parts share a common Source part type. After these custom attributes are added to the part type template, you can create a few components for testing (in the diagram: home part 100068 is sourced from partner AVX). The PDXpert database contains many objects, but only public views (with a View suffix) and user-defined views (with a My prefix) remain stable from one release to the next. 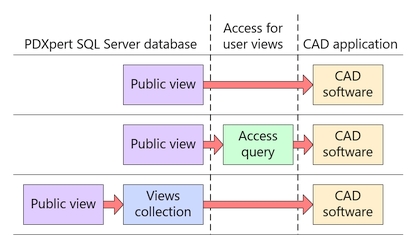 Queries cannot use any database tables or private views (which have a _View suffix). Use SQL Server Management Studio, Microsoft Access, or any ODBC client to browse the public views. In particular, examine the public SourceItemMasterView, which is derived from the more basic public ItemMasterView part & document list. The SourceItemMasterView is a side-by-side grouping of your company-defined parts (and documents), along with up to 3 qualified sources. All items include columns for the custom attributes. Never attempt to create new records, or update or delete existing data, using SQL statements. Use only SQL SELECT statements to read data. Depending upon your choice of access methods, these statements will be saved in Access as queries or in SQL Server as user-defined views. If you're saving SQL Server views within the PDXpert database, you'll create a new member of the Views collection within the PDXpert Collection Explorer, and name your view beginning with the characters My (as in MyReleasedParts). Calculated values rename the cost and datasheet columns, and truncate any excessively-long description to 250 Unicode characters. You may need to make other calculations, apply filters to select only released parts, or convert data types. If the part type Resistor is always a home part, then simplify the filter to WHERE [Type]='Resistor'. The user-defined view MyCapacitors is similar, although you'll use [rating] instead of [tolerance], and the WHERE clause will substitute [Type]='Capacitor'. You've created your part types and defined their custom attributes, and designed the queries to extract your component data. You'll now connect OrCAD CIS to the selected ODBC data source. For details, refer to the OrCAD CIS Users Guide topic "Setting up the ODBC data source". After the connection has been established, create a configuration (.DBC) file as described in the OrCAD CIS Users Guide topic "Creating a configuration file". To export your design's BOM to PDXpert, see Configuring OrCAD Capture CIS to export the BOM. Your queries will need to be reviewed, and possibly repaired, if you make changes within the PDXpert collections. For instance, the example SQL statement will fail if you remove a custom attribute or rename the Resistor. Make changes to your PDXpert collections cautiously to minimize reworking your user-defined views. Access, Excel and Microsoft are trademarks or registered trademarks of Microsoft Corp. Cadence and OrCAD are registered trademarks of Cadence Design Systems, Inc.